This graph is filled with mostly negative values, as the value is at zero when the capital is making new high. Recently, I started to make the new high from July 26, and it is a good news after the months of what I call a “non-profitable” period. The last non-profitable period started on March 15 from where you can see graph draws zigzag in the negative range. The negative number shows the decline from the historical high of the capital. The biggest drawdown was -3.31% on March 15. This is a great downside improvement as the worst drawdown of the previous non-profitable period (Oct-Dec 2009) was 6.39%. 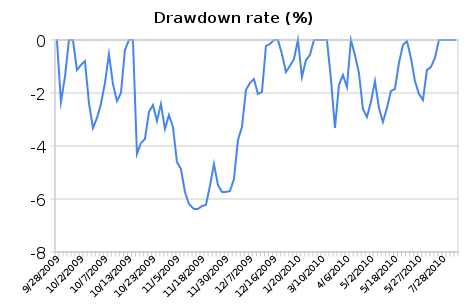 How did I manage to reduce the drawdown this time? The answer is simple. I simply stopped trading and become a mere market observer. I did trade in the non-profitable periods, but I was very selective when to trade. Besides the reduction of the frequency of trading, I also kept the betting size much smaller. I only risked 0.5% of the capital per trade typically, and never bet more than 1% during the period. How did I know that I was entering the non-profitable period? I think non-profitable periods varies from traders to traders. It is the characteristics of the strategies and market conditions that determine if the period is profitable. In my case, I’m looking for a big price move using the radar of Elliott wave principle. I think there are two cases that I would sense that I am going into non-profitable period. The first case is when Elliott wave tells me that the market is in non-impulse wave. When this happens, the reward/risk ratio gets smaller, and this makes me willing to make smaller and smaller bet, eventually I will stop trading until the next anticipation to impulse wave. Elliott wave principle serves me as a great indicator to see the market is profitable. The second case is when my prediction turns out to be wrong. As far as Elliott wave is concerned, this is when my Elliott wave counting turns out to be wrong. In this case, trading loss trades twice or three times in a row is inevitable. But every time I did a losing trade, I would cut the betting size smaller and smaller, and eventually to zero, and I will decide to stop trading until I would see really a good opportunity. In summary, I would suggest traders to always keep the gambler’s ruin in mind, and do the opposite as hard as he or she can. Average gamblers may make money first and keep betting bigger when he feels lucky. Of course the big bet eventually embarrasses him with a big loss. The emotional gambler bets even bigger to get back the loss only to lose everything. Good traders do exactly the opposite. He or she always has the upper limit on the bet size regardless of how lucky he or she has been. When a loss trader happens, the good trader would reduce the bet size rather than trying to get back the loss, and just wait for the market to turn favorable. This requires clear self observation as well as great discipline. But without discipline, no trader would survive the cruel market.